Aiming for a hat-trick of title triumphs, defending champions East Bengal will look for a “good start” against injury ridden archrivals Mohun Bagan in the inaugural match of the ninth National Football League at the Salt Lake stadium here tomorrow. Top Malaysian football club FC Perak’s efforts to sign Indian star Bhaichung Bhutia have come a cropper and they have now opted for an upcoming Indonesian from the tsunami-wrecked Aceh. Cricket's two greatest wicket takers, Shane Warne and Muttiah Muralitharan, are to team up for a one-day series between New Zealand and a World XI to raise funds for Asian tsunami relief efforts, New Zealand Cricket said today. The International Cricket Council today sent out a message of thanks to all those who contributed in some way or the other to the world cricket tsunami appeal match in Melbourne which has already raised nearly Rs 50 crore and more expected from an on-line auction. World number one Roger Federer has led calls for tennis to join other sports in raising money for victims of the south Asian tsunami disaster. The Amtar ground of Nadaun once again proved lucky for Himachal Pradesh, when they won their second one-day Ranji Trophy match here today. The hosts beat Haryana by four wickets. After their defeat in the first one-day match against Punjab at Una on Sunday by just one wicket, the Haryana batsmen once again failed to prosper and buckled under the pace attack of Himachal Pradesh. They were all out for 86 runs in just 33.5 over. Paras Dogra of Himachal Pradesh plays a shot in their one-day Ranji Trophy match against Haryana at Nadaun in Hamirpur on Tuesday. Strong contenders Punjab recorded their second successive win crushing Delhi by 66 runs in the North Zone Ranji Trophy one-day league encounter here today. Electing to bat after winning the toss Punjab rode on an unbeaten 124 runs by opener Ravneet Ricky to compile a fighting 225 runs for the loss of nine wickets. Opening batsman Matthew Hayden will be rested for Australia’s first two matches in the triangular one-day cricket series against West Indies and Pakistan. Hayden has been struggling for form in the past few months and Australia’s chairman of selectors, Trevor Hohns, said he was being given a rest to freshen up. Carlos Moya and Anastasia Myskina slumped out of the Sydney International today, jolting their preparations for next week’s Australian Open. French Open champion Myskina suffered a shock second-round defeat by little-known Chinese qualifier Shuai Peng while Moya was sent packing by Czech Radek Stepanek. Lleyton Hewitt of Australia returns to Karol Beck of Slovakia during their match at the Sydney International tennis tournament in Sydney on Tuesday. Top Seed Hewitt won 6-1, 6-2. Delhi entered the final of the Cooch Behar u-19 cricket tournament by virtue of their first innings lead of 114 runs over Bengal. Delhi made 396 in their first innings and bundled out Bengal for 282 in 98.4 overs, gaining the vital lead. International Amir Singh, an employee of Haryana State Industrial Development Corporation, has been appointed captain of the Haryana squad, which will take part in the Senior National Volleyball Championship, to be organised in Chennai from January 14 to 23, according to Mr Sube Singh, general secretary of the Haryana Volleyball Association. Aiming for a hat-trick of title triumphs, defending champions East Bengal will look for a “good start” against injury ridden archrivals Mohun Bagan in the inaugural match of the ninth National Football League (NFL) at the Salt Lake stadium here tomorrow. Buoyed by the recent triumph in the San Miguel Cup in Nepal, the red-and-gold brigade look confident for a win in the lung opener despite lacking depth in the striking department that brought rich dividends last season. “The derby match is always a 50:50 game. But we have a strong squad and are looking for a victory to make a good start to the ninth NFL,” East Bengal skipper and custodian Sangram Mukherjee said today. While the absence of injury blues was reassuring for coach Subhas Bhowmick, the limited options available upfront and doubts over the match fitness of mercurial striker Bhaichung Bhutia posed concern. As the strike force lacked teeth in the absence of foreigners like Mike Okoro and late Cristiano Junior, the three-time champions would have to bank on Brazilian midfielder Douglas da Silva and Nigerian Ernest Jeremiah, on loan from Ever Ready, for unsettling the rival citadel. Mohun Bagan, on the other hand, were likely to play a cautious game in the opening tie in view of their reduced strength due to injury of key players like Renedy Singh, Sunil Chettri, Tomba Singh and Palash Karmakar. Captain Manitombi Singh, however, termed the match as “a clash between equals” and referred to the luck factor that often influenced the outcome. Manitombi also attributed to the luck factor the defeats in the finals of four consecutive tournaments. “We played well and reached the finals, but were unlucky not to win titles”, he said. The green-and-maroon squad, who tried in vain to pick up a quality foreigner through repeated trials this season, would have to stick to the not-so-impressive Brazilian duo of Eduardo Coelho and Beto. Their latest inclusion, Nigerian defender Babalade, who arrived here yesterday, was unlikely to be fielded in the opening tie, to be inaugurated by Prime Minister Manmohan Singh. Coach Subrata Bhattacharjee would bank on his creative midfield, comprising the likes of Jerry Zirsanga, Basudeb Mondal and Mehtab Hossain while Ashim Biswas would be the mainstay upfront. Both city giants were, however, happy at the initiatives taken by the AIFF to provide adequate medical facilities on the ground in the NFL matches following the on-field death of Junior. “We are getting this type of medical facilities for the first time. It is good for the players,” Singh said. The coaches also welcomed the initiative to raise welfare funds from the ticket sales of the opening match for the family of Junior, who died during the Federation Cup final last month. The 28-year-old Bhutia, who played on loan for Perak for 10 weeks last season to play in the Malaysia Cup competition, was high on the club’s choice following the exit of three strikers — Malaysian national team players Khalid Jamlus and V. Saravanan and Liberian Frank Seator. But Perak, who were looking to strengthen the team before the start of the Super League season, were told recently that East Bengal had extended Bhutia’s contract to May. The Indian player also got married last month and might prefer to remain at home for the moment, The Star reported today. The report also said Bhutia had sounded out his interest of playing for Perak to team manager Datuk Jamal Nasir Rasdi after his 10-week loan stint. With Bhutia out of the picture, Perak opted for 20-year-old Rachmana Dani from the tsunami-wrecked Aceh as one of their foreign players. Dani followed the team back to Perak for selection trials after the Aceh Governor’s Invitation Cup on December 13 and that probably saved him from the killer waves on December 26. The three matches later this month were hastily arranged after Sri Lanka cancelled their tour of New Zealand in December after the tsunamis devastated their homeland. In addition to releasing players for the World XI, Sri Lanka will return to New Zealand in April to play the two Test matches originally scheduled for this month, New Zealand Cricket (NZC) chief executive Martin Snedden said. The one-day series has been arranged in conjunction with the Federation of International Cricketers' Associations so the combined team will be known as the FICA World XI. It will be captained by Australian spin bowler Warne, who will play all three matches along with Sri Lanka's spin wizard Muralitharan, while the rest of the line up will vary slightly depending on player availability for each game. "It will be exciting to see these two rival bowlers working in tandem in what should be closely fought matches," Snedden said. Retired South African Jonty Rhodes will be player coach with Sri Lankan Sanath Jayasuriya as vice-captain. Ten players available for all three matches are Warne, Muralitharan, Jayasuriya, Rhodes, retired Zimababwe wicketkeeper-batsman Andy Flower, retired England batsman Graeme Hick, Sri Lankan wicketkeeper-batsman Kumar Sangakkara, Australian allrounder Ian Harvey, Zimbabwe pace bowler Heath Streak and Sri Lankan pace bowler Chaminda Vaas. Available for the first two games are England batsman Nick Knight and South African allrounder Lance Klusener, while games two and three could involve Australian opening batsman Matthew Elliot and Australian pace bowler Andy Bichel. Former Australian one-day specialist Michael Bevan and Australia's opening batsman Justin Langer are available for the third match only. Snedden said funds raised from the tour would be distributed to Sri Lanka Cricket's "Cricket-Aid" programme and to World Vision. "Given the devastating effect of the tsunami on Sri Lanka and Asia, as well as the inclusion of Sri Lankans in the FICA 11, it is appropriate that the NZC further supports international efforts by cricketing countries to help raise funds for tsunami victims," he said. Cricket Australia had rescheduled one round of their domestic competition to free up players for the world team. The NZC could not immediately confirm the venues of the Sri Lankan Tests when the side returns in April because of the potential to clash with Super 12 rugby union fixtures. ICC President Ehsan Mani said the cricket world had shown tremendous unity in staging a major fund-raising match within two weeks of the disaster that hit the Asian coastline on December 26. "Sports has the power to make a positive difference and I have been heartened by the way in which cricket has united across political divides to raise millions of dollars for the World Cricket Tsunami Appeal," Mani said in a statement here. The charity match yesterday saw a capacity crowd of 71,101 gather at the Melbourne Cricket Ground besides a few millions who watched the action 'live' on television across 122 countries. World number one Roger Federer has led calls for tennis to join other sports in raising money for victims of the south Asian tsunami disaster. Federer said tennis players should follow the example set by the world's top cricketers, who joined forces for a one-day international in Melbourne yesterday which raised more than $ 10.63 million for the relief effort. ''I straightaway was thinking about different options for us to help,'' the Swiss told reporters at today's draw for the Kooyong Classic, the traditional warm-up event for next week's Australian Open. Andre Agassi echoed Federer's comments, saying that the governing bodies of tennis should come together to organise events. ''I think this would be the best opportunity in the world for all of us (players) to come together,'' said the American. Thousands of people in south and east Asia were killed in the giant waves triggered by an undersea earthquake off the Indonesian island of Sumatra on December 26. Like many tournaments, the Kooyong Classic will be holding daily collections, with the money raised being donated to UNICEF, the United Nations Children's Fund. Top seed Federer will open his bid for the title in the eight-man event at Kooyong against French Open champion Gaston Gaudio of Argentina. Another Argentine, defending champion David Nalbandian, meets Briton Tim Henman, Agassi faces Olympic champion Nicolas Massu of Chile and American Andy Roddick takes on Paradorn Srichaphan of Thailand. The Amtar ground of Nadaun once again proved lucky for Himachal Pradesh, when they won their second one-day Ranji Trophy match here today. The hosts beat Haryana by four wickets. After their defeat in the first one-day match against Punjab at Una on Sunday by just one wicket, the Haryana batsmen once again failed to prosper and buckled under the pace attack of Himachal Pradesh. They were all out for 86 runs in just 33.5 over. Bhageshwar Bisht and Amit Mishra were the most successful batsmen and scored 13 and 17 not out, respectively. Both hit two fours. Amit Mishra remained on crease for 71 minutes and faced 49 deliveries, while Bhageshwar Bisht also faced 35 deliveries and remained on the crease for 65 minutes. For Himachal Pradesh Ashok Thakur was the most successful bowler with four for 15 and Sangram Singh claimed 3 for 16. Vikramjit Malik, Kuldip Dewan and Saurav Rattan also got one wicket each. There were 20 extras. Haryana could have been in deeper trouble had captain Sandeep Sharma not dropped the catch of opener Bhageshwar when he was on 5. Haryana team had two players, Joginder Sharma and captain Ajay Ratra, who have played for the country. Earlier, HP captain, Sandeep Sharma won the toss for the second time and opted to field. Haryana batsmen came a cropper in the face of the disciplined rival bowling attack. Only Bhageshwar and Ratra could reach the double-figure mark, while the rest of other batsmen failed do anything worthwhile. For Haryana, Sachin Rana got 3 for 33, while Joginder Sharma took 2 for 27 runs. Paras Dogra was declared Man of the Match. He hit seven fours. Himachal Pradesh got five points from this match, including one bonus point. Earlier, Suresh Chandel, MP, who declared the match open, announced a grant of Rs 2.50 lakh for Amtar ground. Fall of wickets: 1-18, 2-18, 3-27, 4-37, 5-42, 6-80. Bowling: Joginder Sharma 7-1-27-2 Sachin Rana 6-0-33-3, Gaurab Vasistha 2-1-14-1, Pradeep Sahu 1.4-0-9-0. Strong contenders Punjab recorded their second successive win crushing Delhi by 66 runs in the North Zone Ranji Trophy one-day league encounter here today. Electing to bat after winning the toss Punjab rode on an unbeaten 124 runs by opener Ravneet Ricky to compile a fighting 225 runs for the loss of nine wickets. Except for Harbhajan Singh (24) no other Punjab batsman could make any useful contribution. Ricky had scored an unbeaten 96 in the first match against Haryana and was once again the architect of his sides victory. For Delhi, medium pacer Ashish Nehra picked up three wickets and his new ball partner Amit Bhandari picked up two. Punjab’s medium pacer Gagandeep Singh jolted the Delhi innings claiming four wickets for just 15 runs. Spinner Vipul Sharma claimed three wickets. Punjab: Ricky not out 124, Sodhi c Chetanya b Nehra 18, Yuvraj lbw Nehra 16, Dharmani b Bhatia 07, Gupta run out 02, Mongia c Dhawan b Yogesh 01, Vipul c Varun b Nehra 12, Harbhajan c Varun b Bhandari 24, Uniyal c Jadeja b Bhandari 09, Gagandeep run out 10. Delhi: Gambhir c Gaurav b Gagandeep 03, Dhawan lbw Gagandeep 13, Minhas c Panjak b Gagandeep 04, Jadeja lbw Gagandeep 10, Rajan Gupta c and b Vipul 32, Bhatia c Mongia b Yuvraj 28, Varun st b Mongia 33, Nehra st b Vipul 06, Chetanya run out 01, Bhandari c VRB Singh b Vipul Sharma 05, Yogesh N.O. 05. Fall of wickets: 1/7, 2/18, 3/14, 4/42, 5/85, 6/133, 7/142, 8/143, 9/155, 10/159. Services defeated Jammu and Kashmir by 64 runs in the North Zone Ranji Trophy one-day match at Indira ground at Una today. Services won the toss and elected to bat. Thanks to 76 runs by opener Narinder Singh and equally valuable 88 runs by No 4 batsman Yashpal Singh, Services recovered well after the early loss of two wickets. Rajbir Singh chipped in with unbeaten 43 down the order to enable Services post an impressive 260 for the loss of seven wickets. Medium pacer Abid Nabi and captain Dhruv Mahajan claimed two wickets apiece. For Jammu and Kashmir, skipper Dhruv Mahajan waged a lone battle chasing this total, while no other batsman could stay at the wicket. Wickets kept on tumbling at regular intervals. Mahajan's solid knock of 88 went futile as his side was bowled out for 196 in 47.5 overs. Shammi Salaria with 29 runs was the next highest scorer for the side. New ball bowler Sudhakar Ghag bowled beautifully and claimed four wickets giving away 21 runs. Brief scores: Services (for the loss of 7 wickets in 50 overs): 260 ( Narinder Singh 76, Yashpal Singh 88, Rajbir Singh 43 n.o., Sarabjit Singh 19. Abid Nabi 2 for 36, Dhruv Mahajan 2 for 35); Jammu and Kashmir ( all out in 47.5 overs ): 196. Dhruv Mahajan 88, Shammi Salaria 29, Vivek Singh 17, Majid Dar 14. Sudhakar Ghag 4 for 21, Manish Jha 3 for 30, Arun Sharma 2 for 54, Faizal Mohammad 1 for 41. Shuai, ranked 80th in the world, raced to a 6-1, 6-3 triumph as Myskina struggled to cope with the hot and windy conditions at the Olympic tennis centre. Russia’s first female grand slam winner committed a whopping 46 unforced errors to leave her short on match practice heading to Melbourne. “The conditions were tough, but thatis no excuse,” she said. “I am not confident, but I have to look forward to the Australian Open. It is one more week, so I will have time for some practice,” she said. Moya had flown straight to Sydney after winning the Chennai Open on Sunday and donating his prize money to the tsunami relief fund. The Spanish Davis Cup hero looked to have his first round encounter with Stepanek under control when he won six games on the trot to take the first set before falling 2-6, 6-4, 6-2. Men’s champion Lleyton Hewitt rebounded from his early exit at last week’s Australian hardcourt championship in Adelaide to crush Slovak Karol Beck 6-1, 6-2 in the first round. Hewitt cruised to victory in 67 minutes to set up a meeting with Arnaud Clement after the Frenchman beat Czech Tomas Zib 6-1, 6-3. “That was pretty good. 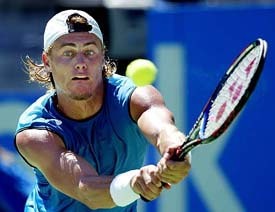 I felt like I moved the ball around well,” Hewitt said. “I have done all the hard work leading into the Australian Open, so now it is really just about keeping the confidence levels up,” he said. Bengal, resuming at their overnight score of 111 for two, lost wickets at regular intervals to be all out for 282 in 98.4 overs. Opener Bhattacharya, who retired hurt yesterday, was the top scorer with 52 while A. Gupta made 43 runs. For Delhi, leg-spinner A. Jain was the most successful bowler claiming three wickets for 60 runs. He was well supported by H. Gautam and R. Kapoor, who took two wickets each. In their second innings, Delhi lost five wickets for 128 runs in the remaining 30 overs. P. Bisht was unlucky not to complete his fifty as he was run out on 48. 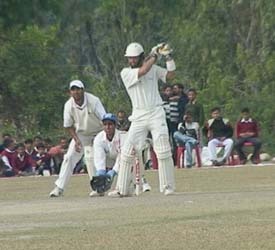 Vadodara: Defending champions Uttar Pradesh entered the final of the Cooch Behar cricket tournament by virtue of their 91-run first innings’ lead over Vidarbha as their three-day semifinal ended in a draw here on Tuesday. Uttar Pradesh, who maintained their superiority over their opponents in all departments of the game, shot out Vidarbha for 207 barely two hours after resumption of play in the morning. Vidarbha resumed at their overnight score of 146 for 6 and folded up for 207 in reply to Uttar Pradesh’s first innings score of 298 as Avinash Yadav (4 for 63) and Piyush Chawla ripped through their tailenders. The fighting-fit Haryana squad virtually comprises HSIDC players who have been recruited under the state sports policy. Haryana team is studded with a number of senior and junior international players. Prominent among them are Raghuveer Singh, Dinesh Kumar, Sanjay Kumar, junior India captain Sube Singh and Anil Kumar. The team left for Chennai today. Om Prakash is accompanying the Haryana spikers as head coach. Haryana team: Amir Singh (captain), Sanjay Kumar, Dinesh Kumar, Jitender Singh, Gurpreet, Sube Singh, Surjit Singh, Anil Kumar, Surender Singh, Vikash and Sandeep Kumar.